Note: Sabine has a jetpack which takes up the usual aim down sight button. Note: Sabine can use the darksaber to block melee attacks, lightsabers, and lightning, but not blaster bolts, since she doesn't use the force. 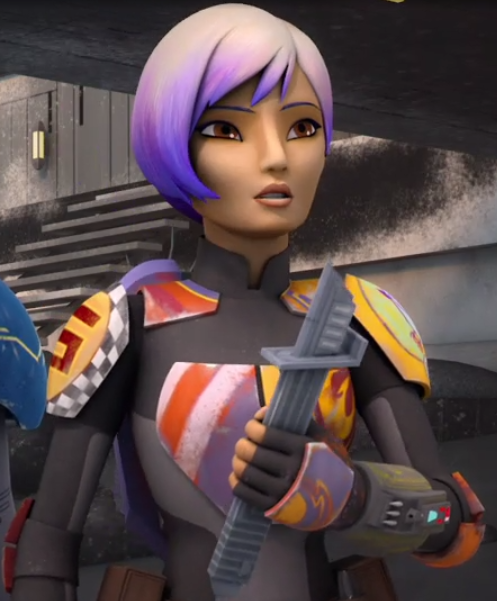 Darksaber- Sabine switches to her darksaber. 0.5 second activation time for switching between her pistols and darksaber. -Repulsor has a 20/30/40/50% bigger area of effect. -Repulsor has 20/40/60/80% more knockback, and deals an extra 10/20/30/40 damage if enemies impact a wall, or 10/20/30/40 extra damage if fired downward while flying. -Sabine has 10/15/20/25% more stamina while using the darksaber. -Sabine's shield has 25/50/75/100 more health. -Sabine's cooldowns are reduced by 10/15/20/25%. -Sabine can regen 25/50/75/100 more health. 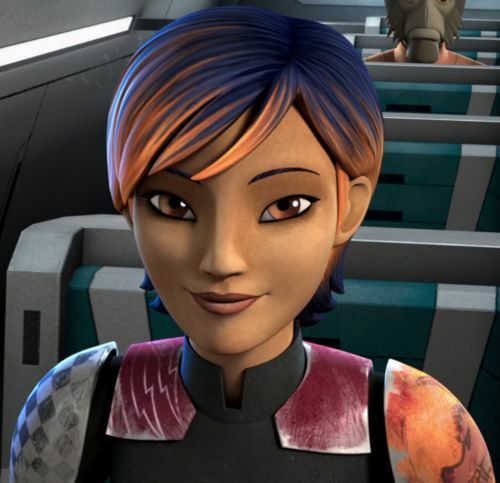 -Sabine can fire her pistols 5/10/15/20% faster, at the cost of 10% more heat buildup. -Sabine's jetpack uses 10/15/20/25% less fuel. -Pistol kills automatically reduce the heat bar by 10/20/30/40%. -Don't read too much into it kid. -My friends make the impossible possible. 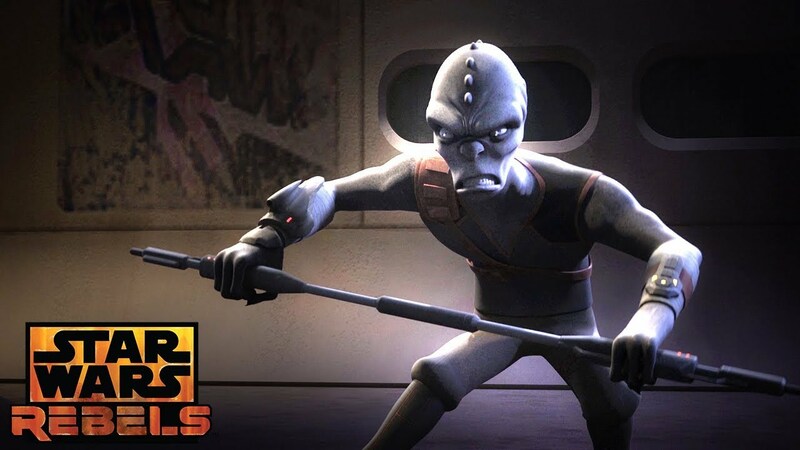 Note: Rukh can block melee attacks and lightsabers but not blasters. Rukh, being an assassin, does 40 extra damage with attacks from behind. Ambush- Rukh activates his cloaking device, which activates a 12 second timer. The more still Rukh is while the cloak is active, the less noticeable it's faint shimmer is to enemies. The cloak uses 1.5x more active time while Ruhk is walking and 2x more active time while Rukh is running. Taking damage while the cloak is active takes 2 seconds off the timer and makes Rukh more noticeable for 1 second. Attacking while the cloak is active ends the cloak and does 180 damage to the front of an enemy and 220 damage to the back of an enemy. If Rukh is the target in HvV, using Ambush will remove the target icon from over his head, but the timer counts down twice as fast. 22 second cooldown. Stalking Prey- Rukh puts his electrostaff on his back and runs on all fours for 12 seconds, allowing him to run 50% faster. Thanks to his strong sense of smell, he can see the outline of enemies within a 20m radius of him through walls while the ability is active. Attacking while the ability is active uses his fists, which deal 90 damage per attack with a short lunge. -Ambush lasts 3/4/5/6 seconds longer. -Attacking while ambush is active does 30/40/50/60 bonus damage from behind. -Stalking Prey lasts 1/2/3/4 seconds longer. -Melee attacks during stalking prey do 5/10/15/20 extra damage. -The radius of Stalking Prey's scent tracking effect is increased by 3/6/9/12 meters. -Blaster shots use 10/20/30/40% less active time. -Rukh has 12/18/24/30% damage reduction to blaster fire. LOVE what you did with Sabine. 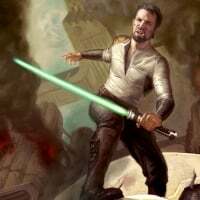 The darksaber would definitely create a unique jet pack user! Sadly, I believe Rukh is not mainstream enough to even be considered. But i loved him in Rebels.